I dunno, he just looks like a Nathan to me. Every Nathan I know is lazy, hirsute, and luxuriant. Fritz, after one of the 2011 winners of the World Beard and Moustache Championships. Gottfried. His favorite food is pickles. By the way, from Wikipedia: Nathan Hale was a soldier for the Continental Army during the American Revolutionary War. Grumblio Gardensi is the gnome hairdresser, who tries all the hair care products on himself before selling them to the public, resulting in a fantastic beard. His favorite food is chilies, as noted by his jalapeño-shaped hat. All I can think is Gary! Jack: Mr. Feinty--I know why he feinted. 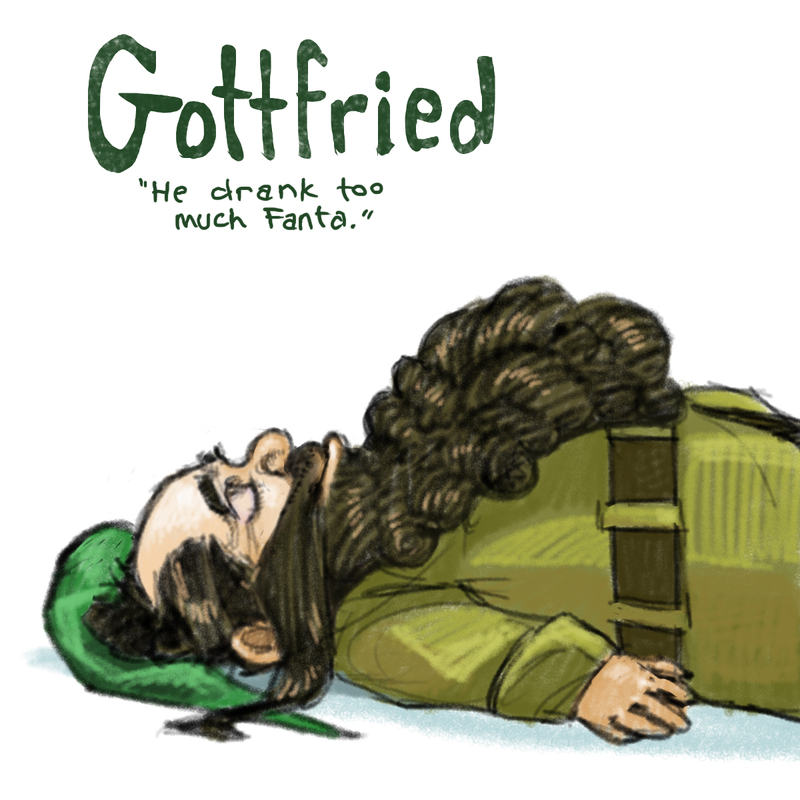 He drank too much Fanta! Lawrence the Luxuriously-Bearded. He likes lava and lampshades and laughter and labradoodles and... pie. Seen here watching a flock of migrating dandelion seeds, Ruddlef is often found with his gaze skyward. Many gnomes envy his luxuriant beard, but his prize possession is actually his sturdy belt, from which he can hang all sorts of useful items such as oddly shaped pebbles or gently-used floss. Curly Catgnap. His hobby is watching cobwebs form. Garlbritt of the luxurious curls. He is dreaming of winning the Quiditch world cup, which is part 248 of his never ending dream of being a wizard and meeting Harry Potter. He tried a spell once, but instead of giving him more hair on top, it made his beard super curly and now he can only burp if he stands on one foot--pity, really. Gregori - the color of his tunic makes me think of peas, which in turn makes me think of Gregor Mendel.